Do you love your horse, but he’s stiff, limited & fearful? Learn fascia tech with Conformation Balancing, fascia for horses. Workshops & Levels. Book & DVD. Memberships. Your riding seat is good—yet, if your horse is stiff & hurts, you’re both stuck. Most horses have stuck, tight areas. These stiff areas are not “fixed” with training or suppling exercises. The muscles can’t slide. The horse has good days & not so good days. He’s jammed up. This hurts & makes him anxious. Flowing fascia opens stuck areas & hard adhesions. The horse feels better, not fearful. Your 2 hands have the power to help him. Workshops, Classes & Levels. Coming: ONLINE COURSES. Membership. 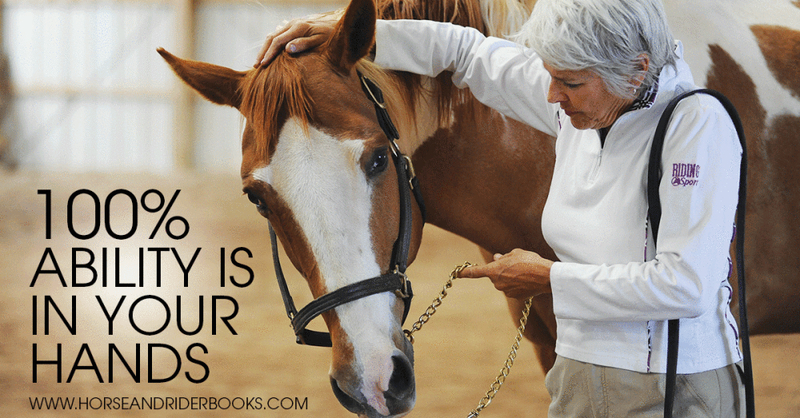 Be ahead of the crowd, learn about FASCIA, the body’s internet, and keep your horse fit & happy. 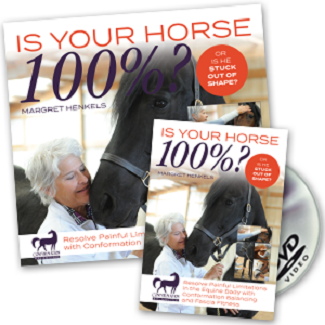 “IS YOUR HORSE 100%?” BOOK & DVD by author/fascia instructor Margret Henkels. Buy direct from Trafalgar Square Books, the leading horse book publisher, with link below. I’ve just finished reading your book and first I want to thank you for writing it. I loved it !!!!!!!!! I’ve had Reiki healing for many years, reading your book added so much to me, it was like finding the missing piece. I feel more complete, strong and self assured in my bodywork. Also my horses who are used to my hands on have had many and long still points and strong releases. It will be an adventure to follow them in the future changes. Be ahead of the crowd, learn Fascia tech for horse fitness. Ten minute sessions will solve old limits & pain, while preventing new ones. Start with the book & DVD; take a workshop or Level. Advance a horse that shows, extend ability for an older horse and be your horse’s best friend!